She took handfuls of dirt and flung it in her own face, overcome. More families arrived on Thursday at the site of the Ethiopian Airlines crash that killed 157 people. They came with the hope that they could bring some trace of their loved ones home. Some fell to their knees in grief when they learned there was nothing left. Others hurled themselves forward, wailing, or staggered in relatives’ arms. The mourning was mixed with frustration. For some, their beliefs dictated they must have something to bury. “Big families, a lot of people and the full Israeli nation is waiting for these remains and we will not go out of Ethiopia until we find the remains to bury them,” said Moshi Biton of Israel, who lost his brother, Shimon Daniel Re’em Biton. Some Muslim families fretted. A body must be buried as soon as possible. In the Ethiopian Orthodox religion, bodies are buried a day after death. 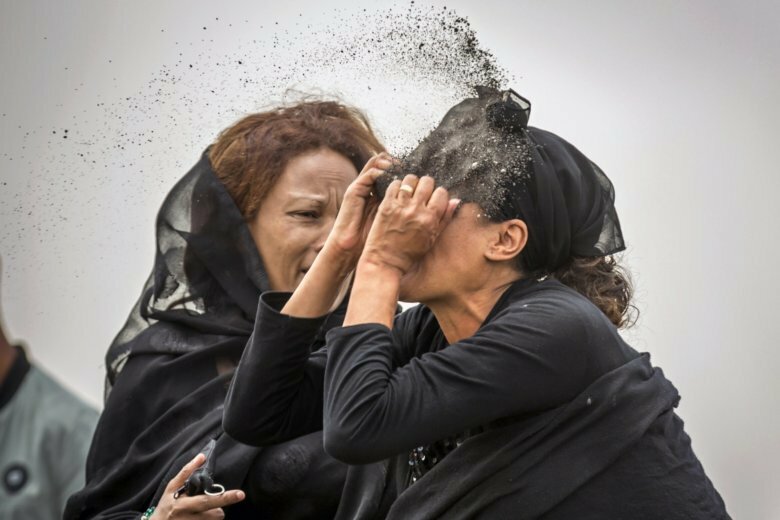 On Wednesday the family of a young crew member on the doomed flight, Sara Gebremichael, held a religious ceremony for her photograph. They had nothing more. Many of the grieving gathered at the rural, dusty crash site outside Ethiopia’s capital, Addis Ababa. The dead came from 35 countries. Some families, including that of the flight’s senior pilot, Capt. Yared Getachew, came bearing large framed photographs of the dead. In one, a victim wore a graduate’s cap and gown, a source of immense pride. Others arriving wore black T-shirts printed with a photo in remembrance. They held sticks of incense, the flames flaring in the wind. One man held a tiny, torn scrap of document showing a photo of one of the dead. In the background, searchers carrying large clear plastic bags continued to move slowly through the rubble, looking for more. Some relatives at the scene expressed frustration, saying authorities were not sharing the information they badly needed. An airline spokesman on Wednesday said some remains had been found and were in a freezer awaiting the forensic DNA work needed for identifications. On Thursday it was no longer clear how long that work, once estimated at five days or more, would take. Israel’s consul to Ethiopia, Opher Dach, suggested the remains would be sent to a laboratory Britain. The airline, overwhelmed with requests, announced it would take no more questions from reporters and would post any developments on social media and its website. Even at an airline briefing for families in Addis Ababa some tearful relatives stormed out, demanding more.